A record level of £13m is being invested in South Ayrshire’s roads, footpaths and street lights over the next year. South Ayrshire Council has approved its road improvement plan 2018/19, with £10m invested, plus a further £3 million of capital funding. Over half the money will be used specifically for road reconstruction, resurfacing and improvement works including pothole repairs, carriageway patching, footway works and winter treatment. The remaining funds will be used for street lighting repairs, introducing LED lighting (which is cheaper and uses less energy) in more areas, bridge works, and to progress the introduction of 20mph speed limits in rural villages. Councillor Ian Cochrane, portfolio holder for sustainability and the environment, said: “We know how important the roads network is for growing our economy and supporting our towns and villages and that’s why we’ve pulled out all the stops to boost the funding available over the next year and really start to make a difference. “While we know it’s not everything that’s needed, I have no doubt it will make a meaningful and lasting difference and significantly improve the condition of the specified roads across South Ayrshire. “The projects we will be progressing have been identified and prioritised using our detailed ranking system, which will allow us to get to work where it’s needed most as soon as possible. And all the road surfacing works will be complete by autumn so they are in the best possible condition before winter hits. “This will allow us to continue the positive downward trend in the percentage of our roads needing repair, which has gone down from 45% to 41% over the last five years. New LED lighting will replace the current street lights in various parts of Maybole, at a cost of £165,000. There are over 20,000 street lights in South Ayrshire and the proposed programme for 2018/19 has identified the parts of the network in poorest condition. This work will enable the reduction in the number of columns over thirty years old along with improving the cable network. Included in the road repair programme is: £300,000 of resurfacing work on the A714 Barrhill road; £10,000 for preparatory work for the realignment of the A714 at Pinwherry Bridge; £150,000 of resurfacing work to the B741 Girvan Dailly road; £150,000 of resurfacing work on the B741 Dailly to Straiton Drumburie to junction U25. 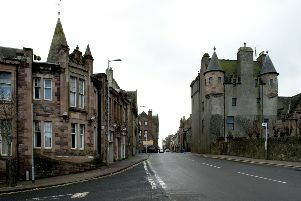 In Maybole road improvements include: B7023 Culzean Road resurfacing (£52,500) Whitfaulds to 30mph sign; resurfacing B7024 Maybole/Alloway Resurfacing Culroy towards the Brae of Nether Auchendrane (£116,250); and £21,600 of resurfacing work on the U15 at Burncrooks. Resurfacing work will be done on the C13 Assel Road, Pinmore, at a cost of £206,250. £885,000 of bridge repair work will be carried out across South Ayrshire over the current financial year.